Every so often, I have these bouts of “back to the roots” behaviour. A photo, an object, a custom, a memory or even food that I cook can trigger this trip to where I came from. On such occasions, one can spy me sitting crouched in my favourite chair as if I were seated on a “paat”, one of those portable pallet-like wood seats that we used to sit on for a meal. The circumstance and mood dictate that I eat rice with my hands and out of a “taat” or steel plate, which is a departure from the “firang” cutlery and crockery. What do I eat with this rice? Well, it could be methkoot, tup and bhaat, (methkoot, rice and ghee) or just a plain “tup, meeth, bhaat” (rice, salt and ghee) with some lemon pickle. These are “back to the roots” combinations all right, but don’t really qualify, as they are fairly tame and urban. For anything rustic, it has to be going back even further. The basic rule is that this rice needs to be eaten dry, without the well meaning but dampening interference of the daal. Well, an exception to this is the plain cooked dal, with a slight grain left in it. I am not talking about the saadha varan, the bourgeoisie daal laced with hing, turmeric, salt and jaggery and anointed with ghee. I am talking about cooked dal, straight out of the pressure cooker. "How boring! "- one may say. The distant drumbeats are syncopated by the sounds of near empty pots being scraped by ladles. The above is a good description of me in my fanciful “humble roots” mood and pose. But far from being humble, my rice actually gets quite rich. It gets embellished with tadka made with oil and mustard. You mix the rice with the cooked daal and some salt. Then you pour as much tadka as you dare/are allowed/ can stomach. You may choose to enhance this experience with a dry subji, but it’s better with some pickle, the older, the mustier, the better. A word of advice, don’t pull a Lady Macbeth, worrying about the smell of the pickle from your fingers afterwards. Mind you, one has to mash everything together, savouring the feel, enjoying the texture, deliberating over the proportions and anticipating the taste. Then, roll the rice mixture into a ball and pop it whole into your mouth. The most bucolic type of dry rice is the one mixed with some stir-fried greens heavy with garlic and with a smattering of some dry daal. You can even crush the diabolical juices from the cooked red chillies in the bhaji into the rice, a feat you can’t attempt with a spoon or a fork. I don’t need to tell you that I get teased for this. My younger daughter calls this my "gavthi" or “villager’s fantasy”. I beg to differ - this is my rustic reverie. What is your gavthi, er rustic fantasy? We get these Asian greens here – they have a distinct mustardy taste. You can use any greens for this dish. Heat the oil in a pan and add the mustard seeds. Once they start to crackle, add the red chillies, onion and garlic and sauté for a minute. Then add the chopped greens and stir. 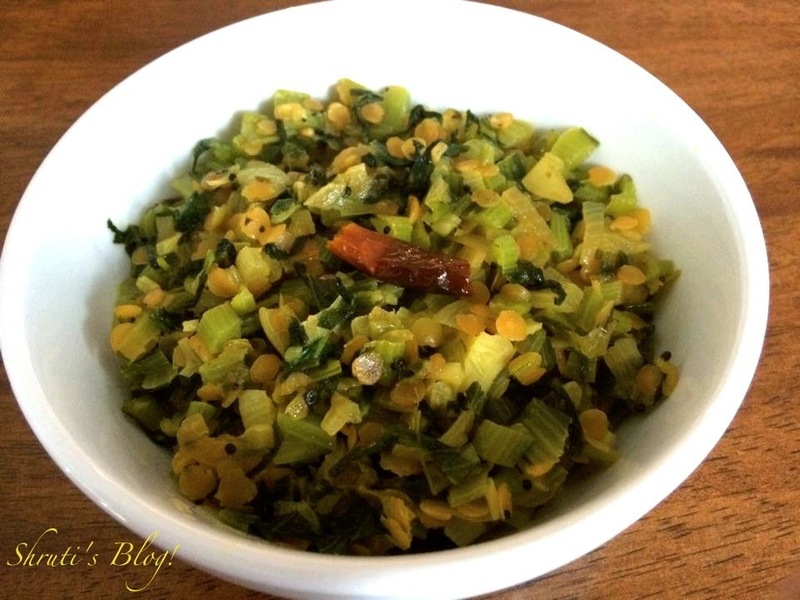 Sprinkle the washed masoor dal neatly over the greens. The idea here is to allow the masoor to cook in the moisture and steam let out by the cooking greens and onions. Cover the pan and cook on low heat for about 7-8 minutes till the masoor dal turns soft and the greens are cooked. You may add just a spoonful of water a couple of times if you notice that the bhaji is sticking to the bottom, but not more than that. Try and keep the dal on top of the greens, so that the moisture and steam emanating out of the greens will cook the masoor dal. Add salt to taste and mix well. Remove from heat. Serve with hot rice and a teaspoon of tadka. Needless to say, it goes very well with jowar/bajra bhakris or rotis as well.